Proudly manufactured in Brisbane for over 20 years. Built to last and backed by our quality guarantee. Superior design and materials combine to produce an umbrella able to withstand the rigours of the most demanding conditions. Built to last with a durable powder-coated aluminium frame, and features a rope pulley system for safety and security. These stunning and stylish side post umbrellas are ideal for pool and spa and garden areas. 2 year canopy and frame warranty. UV safe. A new boutique Art Series Hotel – The Fantauzzo @howardsmithwharves just decked out their fresh pool top terrace with three Heavy Duty Umbrellas! St Joesph's School at Gregory Terrace, Brisbane keep their students out of the sun with our Heavy Duty range of outdoor umbrellas. A great install completed by UltraShade's installation team, at these beautiful apartments at Varsity Lakes. Another fantastic piece of real estate on the Brisbane River opposite the Brisbane Powerhouse. This stunning home on the southern side of Brisbane's iconic river has an incredible view. Accompany that view with the shade and style of our Home & Cafe range of umbrellas and you've got yourself an excellent barbeque area for the summer! 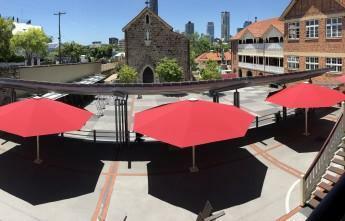 Multiple square Heavy Duty Umbrellas on a second level balcony at Redlands RSL.